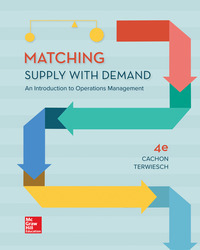 Cachon Matching Supply with Demand 4e is a clear, concise and more rigorous approach to an introductory Operations management course. The authors use their guiding principles “real operations, real solutions” to bring the text and concepts to life, writing the majority of chapters from the perspective of specific companies. Connect: Reliable, intuitive, and rigorous learning management system – the market-leading digital solution.